The Watch Edition doesn't appear to be suffering from the same shipping delays as the cheaper models of Apple's first smartwatch. In fact they're the only ones out in the wild, specifically on the wrists of the cool and famous. Cupertino has been giving out Apple Watch Editions, which it's selling for as much as £12,000 to "influencers" who all have a couple of things in common - they're undoubtably cool and have huge, young online audiences. It's no accident that Pharrell got his first: he's got 4.8m followers on Instagram - the most fashion-friendly social network - 118,000 of which favourited his Watch video. Oh and there's the small matter of 2014's 'Happy' going triple platinum with 1.8m sales and 25m streams online. Just look at that shirt and cap combo, this man can make anything look cool. Like Chanel premier Karl Lagerfeld (below), Beyoncé has been treated to what appears to be an Apple Watch Edition with a solid gold link bracelet which isn't on sale to the public. 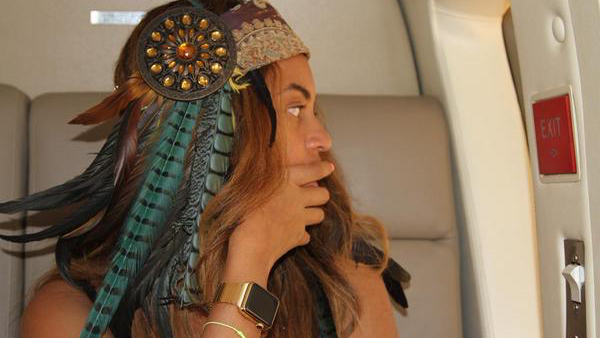 Like other celebs in the Apple Watch club, the pop star isn't particularly concerned with showing off any watchfaces or functions - this isn't a sweaty, geeky unboxing, it's Coachella - this photo is all about the styling, down to the subtle tie-in with details on her feathered headdress. Weirdly it works but when you're looking for accessories to complement your new smartwatch bear this in mind - you are not Beyoncé. It's happened. The First Lady of Fashion, Vogue's editor-in-chief Anna Wintour, has been spotted wearing an Apple Watch. Here she is at a Burberry event, wearing what looks like an Apple Watch Edition with a white Sport band to match her designer frock. She also looks to have quite small wrists so we're guessing its a 38mm Watch. Wintour might not have millions of Instagram or Twitter followers but she essentially decides what American women wear. She's in charge of US Vogue but she also consults with both established and upcoming designers, essentially launches trends and careers plus she has close links to big department stores and retailers too. Pop stars a-plenty have been sporting the Apple Watch but here's someone a little unexpected. The director of the upcoming Star Wars movie, The Force Awakens, flashed a 42mm, stainless steel Apple Watch with a dark blue sport band at a promo stint in California this week. So not everyone gets (or wants) a gold Watch Edition, then. He also took a panorama of the crowd with his iPhone 6 Plus so it's safe to say JJ is an Apple fanboy. If you haven't seen the fresh trailer for The Force Awakens, watch it now. This could be a big one if Karl actually starts wearing it. We're not sure whether that wrist above is the Chanel creative director's wrist or whether it belongs to his assistant/bodyguard (yep) Sébastian Jondeau who posted the pic to Instagram. Either way we do know that the 18-karat yellow gold Watch Edition is custom made for Karl as a gift and features a solid gold link strap that we haven't seen anywhere else yet. That could easily double the top £12,000 price. As an aside, some commenters have pointed out that Jondeau and/or Lagerfeld, who also heads up Fendi and his own label, haven't bothered to set it up before taking the pic, proof that the Apple Watch is succeeding at least in becoming a fashion icon, even without the functions it offers. Pebble had (unofficial) Mario but the Apple Watch has Mickey and nothing beats the House of Mouse for brand recognition and mainstream appeal. Pair that with Katy Perry posting this pic on Instagram with the line 'Oh Mickey, you're so fine, you blow my mind, hey Mickey!' with watch and heart emoticons and Apple's marketing machine couldn't be any happier. That red strap is proving popular with the 'slebs so far - it does give the rose gold Edition a preppy, timeless look. It's hard to tell if the pop star is wearing the 38mm or the standard 42mm size but her fans don't care - a whopping 628,000 of a total of 17.1m of her Instagram followers liked this photo. Drake, Coachella, Apple Watch, Instagram. What a love-in. We're not sure how many Apple Watch Edition customers will be pairing their smartwatch with that red tracksuit and wistful yet aggressive pose but hey, maybe the rapper is a sleeper style icon for the super-rich. He's 'only' got 8.2m Instagram followers but 431,000 of them have been impressed enough with this look to heart the photo so far. One more pop star for you: Sam Smith had his Apple Watch hand delivered by Sir Jony Ive, nice touch. The Grammy-winning British singer took to Instagram to share a pic with his 3.5m followers. His Watch which could be a stainless steel model or possibly an Edition with a lime green band. This one doesn't really count (do any of these really count?-ed) as Christy is essentially the face of the Apple Watch. The model and activist is running the London marathon with one this April and she appeared on stage with Tim Cook at the March event to present a video about how she has used it in her health and fitness regime. She's the perfect spokesmodel for the device - she's elegant, fashionable and cares about her fitness. Also all that charity work proves she's a good person. The Oscars presenter and How I Met Your Mother actor slummed it with the rest of us, trying on an Apple Watch at a New York store on 10 April, otherwise known as try-it-but-you-can't-buy-it day. We don't actually know if he ended up splashing out - or if he was herded to a private room for the Apple Watch Edition demo process - but he looks pretty impressed to us in that pic. Either that or he's really, really confused.